From Turf to Tools is an ongoing investigation in to landscape, material and craft, inspired by local archeological investigations in Rhynie, Aberdeenshire. 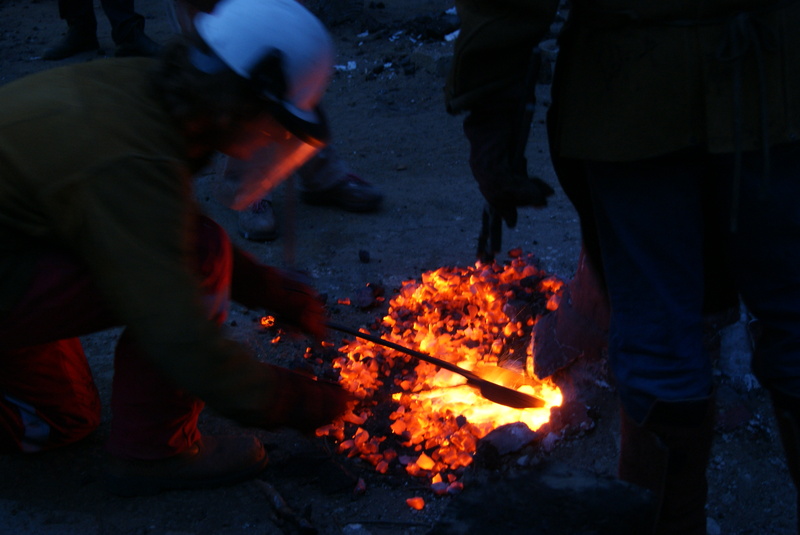 From 11-23th August, the collaboration of Scottish Sculpture Workshop artist Eden Jolly and master blacksmith Darrell Markewitz, with Dr. Gordon Noble, archeologist at University of Aberdeen, will seek to recreate a ceremonial axe – as seen on the Rhynie Man standing stone – through smelting and forging locally sourced materials. Two writers, Maxime Hourani (Lebanon) and Deirdre O’Mahony (Ireland) will document the collaborative research process. The Rhynie Man stone is dated to roughly 700 AD, and shows a man carrying what looks to be a ceremonial axe, the type of which was used to sacrifice cattle – part of an early Pictish King’s role as a religious as well as a secular leader. During the excavations carried out in 2013, a pendent depicting the axe was found, along with metal-working tongs. This find led to the initial bloomery smelt held in Rhynie last summer, and further dialogue between Scottish Sculpture Workshop and the Rhynie investigations. 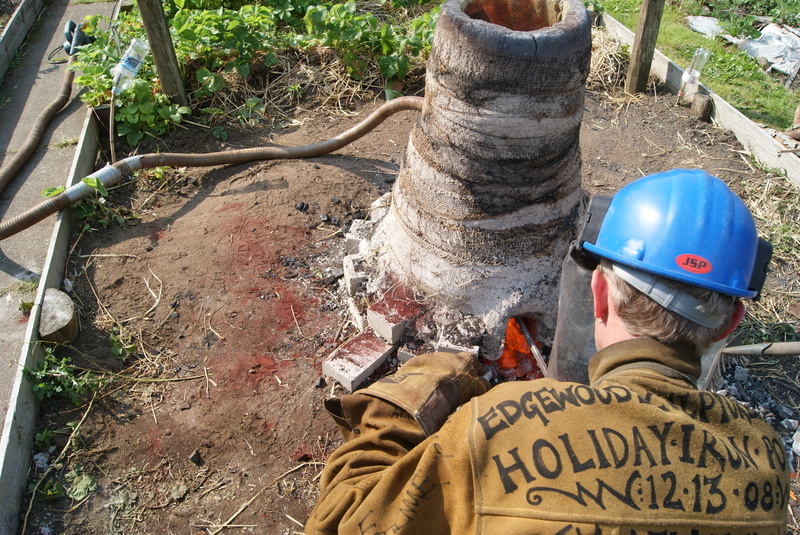 Throughout the two weeks in August, the team will be attempting to create the closest possible historical model of a bloomery furnace – this is the extracting of workable metal from raw materials. This ‘bloom’ will then be forged to create a replica of the Rhynie Man axe. Although there is little information available regarding how these complex processes were undertaken at the time, looking to other excavation sites, such as Culduthel near Inverness, helps establish ideas regarding how it might have worked. For the duration of the project, the team will be joined by a number of artists, archeologists, craftspeople and students in a cross-discipline discussion regarding landscape, materials, resources and history. Of particular interest is the sourcing of a local iron ore – one suggestion being the rare Macaulayitye found at Bennachie. This is the only known source of Macaulayite in the world, and is proposed to be a similar material to that found on Mars. We are actively looking for input from all areas, and welcome any information or skills that are available. The project will culminate in a public open forum during the weekend of 22nd to 23th of August, with demonstrations as well as a sharing of knowledge, skills and ideas. This forum will attempt to address a number of questions regarding both the specifics of the process, as well as how a specific archeological prototype might provide valuable insights into a historical period. From Turf to Tools is offers an opportunity for skill-exchange and training, and as part of this we are also running a two-day course of 30th and 31st of August, lead my Darrell Markewitz, for those looking to gain some direct hands on experience. Titled ‘Aristotle Furnace’ the workshop is to make a tabletop furnace, capable of producing workable iron. The course costs £180 and includes all materials, as well as your own furnace that you can take away with you.